If you are looking for a fun, recreational and educational solution to beat summer’s boredom and heat, well, the answer is Enchanted Kingdom! As summer 2010 kicks off, Enchanted Kingdom opens this year’s most awaited season with a wee, rawr and swoosh as they take amusement park entertainment to the highest level! As the summer heat beats this March, Enchanted Kingdom opened the month with the celebration of Women’s Month. Catch these female celebrity storytellers as they share wonderful lessons through their stories at the Park on March 6, catch Rita Avila, March 7 – Bea Mamon, March 13 – Mrs. Cynthia Mamon, March 14 – Eula Valdez, March 20 – Christine Jacob, March 21 – Cherry Pie Pcache, March 27 – Dolly Anne Carvajal and March 28 - Melanie Marquez. And on April, as we celebrate Easter Season, comedian storytellers will grace this wonderful event at the Park. You can catch on April 10 – Winnie Cordero, April 11 – Bearwin Meily, April 12 – Jose Manalo, April 18 – Candy Pangilinan and April 25 Eugene Domingo. You can also commemorate the Lenten Season with EK’s “Cenakulo Rock” , this musical act which will feature Chad Peralta as Jesus Christ and Vanessa Rangadhol as Mary Magdalene. This coming April too, Dora the Explorer and Diego will invade Enchanted Kingdom too, through their Dora and Diego’s 4D Adventure. 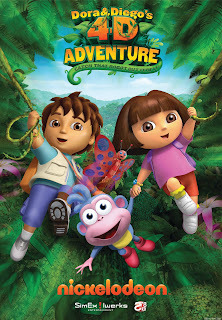 Enjoy watching Dora and Diego through this awesome 4D adventure that kids and kids at heart will surely enjoy! 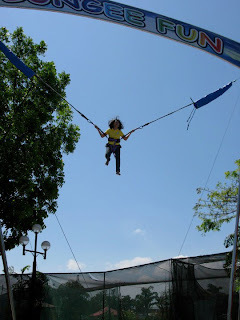 And to top these amazing feature at the country’s the best amusement park, Enchanted Kingdom adds Bungee Fun! This cool and exciting feature will surely hit the mark of those thrill seekers who love taking fun in a different height. Everyone will surely enjoy jumping and looking at the astonishing view of Enchanted Kingdom’s Victoria Park Zone while in the air via Bungee Fun. And if you think that Enchanted Kingdom’s exciting rides is not enough, here’s more to witness this coming summer. Enchanted Kingdom adds up something that will make you mesmerize and jubilant. Guys, let’s welcome this coming Easter Sunday Zoori, the white lion. In partnership with Yupangco Group which brought us Zoobic Safari and Residence Inn, EK will feature “Zoori’s Adventure”, an interactive museum where guests, especially kids, can have a close encounter with mechanical white lions. In this wonderful experience, there are different zones, a replica of colossal caves where guests will go through doors opening to other realms. In these zones, you will learn about the habitat of white lions and how they survive the wild. 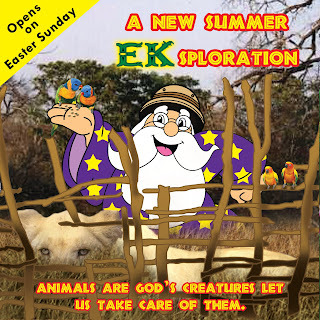 Aside from the white lion encounter, EKsotic birds will also be housed at this magnificent attraction. One thing’s for sure, expect the unexpected in this new feature as exciting and thrilling surprises await everyone. Boo! Hahahaha! And, finally, to beat the summer’s burning heat, Enchanted Kingdom will give us something I thought was very impossible to happen – The Enchanted Kingdom’s Biki Water World! Oh, yeah, baby! Water world in the best amusement park in the land! And what’s best about this, this coming-soon attraction will have a lot of wonderful water activities that everyone will love! It’s like having Subic and Cam Sur water sports here in Sta. Rosa, Laguna! In partnership with Biki World, a Korean company specializing in stimulating water spectacles, thrilling and enjoyable water activities that you’ll surely love this summer is coming in our way! All these and more as Enchanted Kingdom opens Summer 2010 with these amazing new attractions! Enjoy summer and let the magic stays with you! See you in Enchanted Kingdom! any idea of the name who's playing the role of princess victoria? is she alodia santos from malolos bulacan? I didn't get her name e. So I'm not sure where she came from.